Unprepared commuters and slick roads made for a morning mess that had commuters stuck in the snow with nowhere to go. Easy commutes turned in to frustratingly long waits as busy roads came to a standstill Friday morning. Mother Nature put the brakes on commuters as they rushed to get to work; drivers met taillights, slick roads, and long commutes as snow continued to fall. Nick Lokey, a cook at Vildak's Brookside Café, said the snow turned his 25-minute commute into 2.5 hours on Friday. His first concern was checking in at his job. “There's not very many of us back there in the first place, and I’m not normally late, and I felt bad for leaving them hanging and having to do it by themselves,” he said. The worst part of his commute, he said, was being stuck in standstill traffic on the West Dodge Road overpass for about a half-hour. “I'm probably gonna end up spending more time on the road today than I actually get to work,” he said. He said last night, he wasn't expecting anything like this. Karen Burkley said she, too, wasn’t prepared for the snow. “Last night, I was not expecting to wake up this morning and see snow coming down out of the sky,” she said. ”Actually my husband had to go to Wahoo, and it took him an hour and 45 minutes to get home, and it normally would have taken him 25 minutes,” she said. Becca Cartwright said she was surprised by the road conditions. Omaha Mayor Jean Stothert held a press conference Friday afternoon, saying that it wasn’t possible for the road crews to brine the roads, and that storm predictors they follow didn’t give them proper warning about this morning’s snowy forecast. Cartwright and Lokey seemed understanding. “I haven't seen anything or had to deal with anything like that since I started driving,” Lokey said. But at the end of the day it's typical Nebraska weather. "There's really no way you can prepare for it," Cartwright said. The roads have started to clear since this morning, but the drivers 3 News Now spoke with Friday said they still plan to give themselves more time to get to their destinations this evening and will continue to be cautious on the roads tonight. Some drivers told 3 News Now on Friday morning that they weren't happy to wake up to snow-covered streets. "It's a unpleasant surprise," Amber Watts said. "I honestly had no idea it was supposed to snow this morning or I probably would've woke up a little earlier." 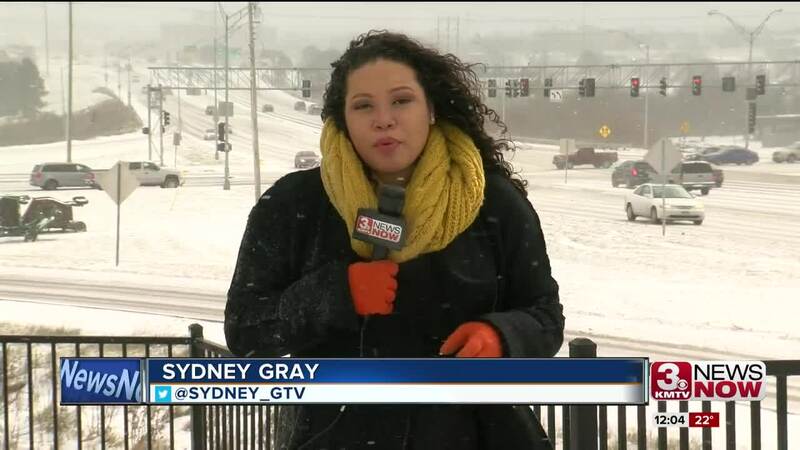 Friday morning's snow caused several accidents on area streets and interstates like the one near I-80 near 84 st.
Omaha police issued accident alerts shortly after the first sights of snow started hitting the ground. "I was pretty irritated, I saw people going around me and cutting people off," one driver said. [They were ] going in the neighborhood and scooping around so they could cut the lines and stuff like that," the driver said. The bridge near the I-L-Q st. exit was down to one lane as multiple semis blocked traffic. Margaret Perry said she tried to stay cautious as she headed to the store. "They were a little slick but I was driving slow so you just have to drive slow and keep a distance away from the car in front of you so we have time to stop," Perry said. 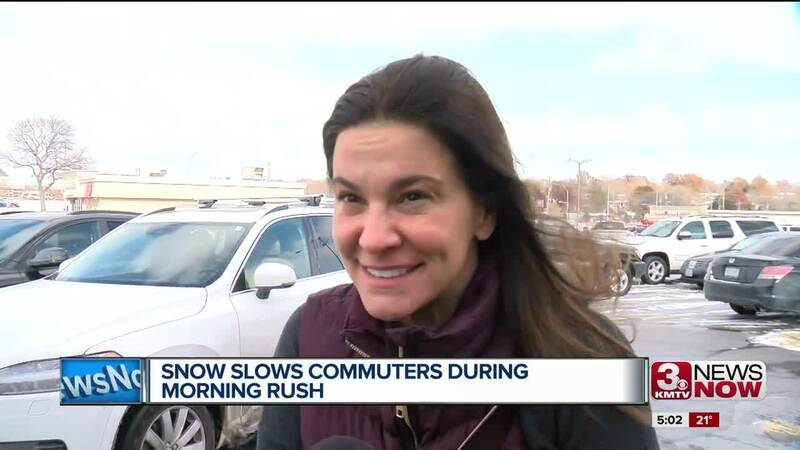 Amber Watts said her morning commute usually takes about 10 to 12 minutes, she stopped halfway and had already been on the road more than 30 minutes. Next time, she said, she'll be more prepared. "[I'll] probably just make sure I have my snow scraper — I should've bought gloves in there — and throw some salt down that's about it," Watts said. Local law enforcement was recommending drivers should remain cautious, increase their following distance and keep it slow on the roads.